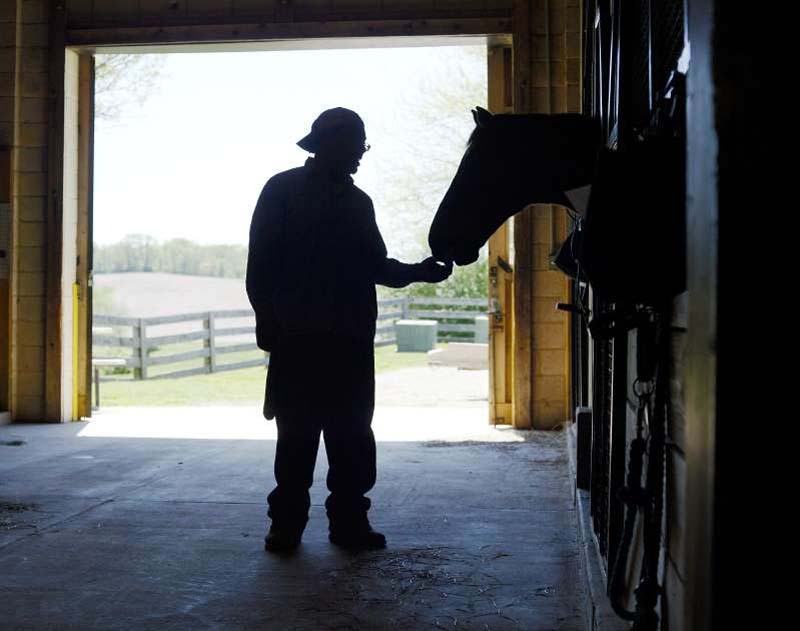 About two miles away from the Central Maryland Correctional Facility in Sykesville sits a farm, the barn among grassy hills, a picket fence winding through. On a sunny day in May, the farm is mostly quiet aside from a few birds whose calls were carried on a soft breeze in the air. It's the quiet - and the open space - that 35-year-old Pablo Lancaster cherishes. For two months, Lancaster has gotten the chance to come out to the farm and work with six horses. It's a nice change of pace for Lancaster, who has been incarcerated for more than a decade on burglary charges. "For me, since I've been locked up 14 years, (the best part is) just to come out here and not see prison walls," he said. "It's quiet, I get to enjoy life a little bit before I get to go home." Lancaster is one of four men involved in a program at the Second Chances Horse Farm. Sarah Stein, the program director, said this program is about bringing horses that no longer have a racing career together with inmates who need to learn how to develop a skill. It's been going on since around 2009 or 2010, she said, and is one of nine programs in the country that partners with the Thoroughbred Retirement Foundation. The inmates involved are in pre-release facility, she said. "The guys who get to come here are ... on good behavior in the prison and are looking for an outside detail," she said. They're at the farm every day, for almost eight hours each day, starting around 7:30 a.m. The men feed the horses, do field work, groom the horses and more. There's also some classroom time, she said, to learn about how to take care of the animals. "They are interacting with horses who are animals who - due to their nature of being prey animals - their main goal is to stay safe. And so the way they interact with other beings is to have a relationship that is always about feeling safe and feeling comfortable," Stein said. This helps the inmates learn about themselves because the horses act as a sort of mirror, she said - the animals can reflect the energy the men bring. "So you really actually have to do some internal work to learn about yourself," she said. For Lancaster, who hopes to finish his bid in about eight months, the program has helped in more ways than one. He came to pick up some skills, he said. He's learned about horsemanship. He's learned how to use farm equipment and drive tractors and do fence work. But it has also helped him emotionally. "I have more confidence. Especially working around a 1,200-pound animal and putting trust in them as they've put in me," Lancaster said. The program has helped him get his social skills back, he added. "I've been numb to it a lot, you know, being incarcerated," Lancaster said. "You know, it's a different way of living inside." At the beginning of his term, Lancaster said his mindset was like he was still on the streets. He was noncompliant, and it wasn't until about nine years ago that he started to change his ways. He's been creating and facilitating groups, he said - anything he can do to help. "I've been doing everything that I can to give back what I've learned ... to the young generation that's coming in," Lancaster added. And he hopes to continue to work with horses once released. Lancaster said he'll be going back to Montgomery County after released and, that if he can get an opportunity to showcase what he has learned, he'll want to use his new skills to pursue a career. Lancaster is not the only one finding a second chance at the farm. Inmate Harry Alger, 42, said he has had addiction issues for half of his life, a struggle which is what got him incarcerated in the first place. "I had a problem for a long time trusting people and stuff so it helped me - the horses helped me learn to trust again," he said. Alger said he kind of lost touch with the outside world over the years because of his struggles. "I'm still learning things about myself because I haven't been clean for ... 20-some years I've been strung out," he said, adding that he's experiencing some things for the first time, or the first time in a long time. He's been incarcerated for about 20 months now, and has about 17 left of his maximum mandatory sentence. But, Alger said, he hopes he can be paroled in October, and has a hearing in the fall. Alger said he'll probably go back to Hagerstown, where he grew up and has family, because it's the "only place I've got to go." But he wants to get away from the area, he said, because a lot of his drug use happened there. He said he's not sure if he'll try to work with horses upon release. Alger said he always did mechanic work, but he isn't picky about a job when he comes out. "If I can find a job in my area with the horses and stuff, then, yeah," he said. "Anything's better than nothing." Regardless of whether the horse-specific skills he's learned will result in a job later, Alger said he has enjoyed his time in the program. He's just finishing, recently having completed his six-month time at the farm. Working with the horses has helped him understand himself and better understand compassion, he said. "I'm going to miss coming out here when I'm not here any longer," he said, later adding, "the program's very therapeutic."